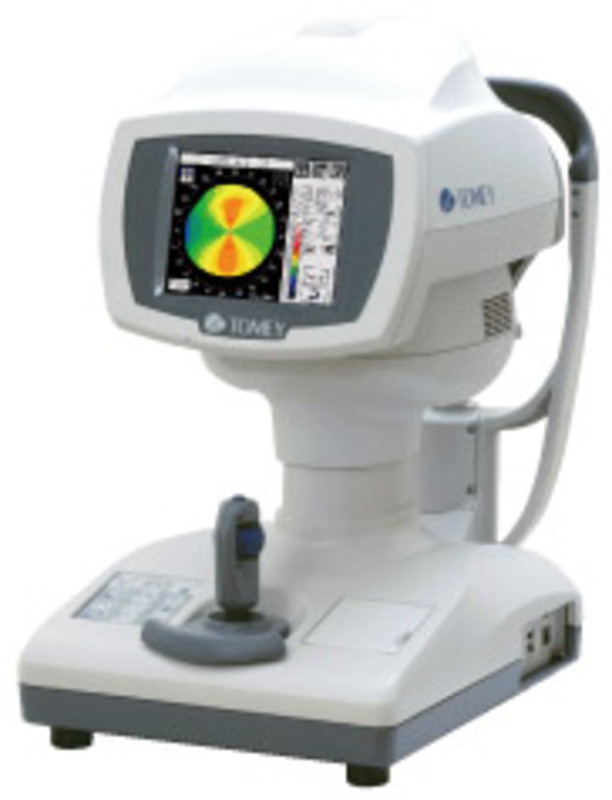 A unique combination of Topography, Autorefraction, Keratometry and TSAS (tear stability analysis system) in one – multi diagnostic replaces four devices with all their functions. The compactness of this instrument is its strength. It is therefore a perfect space and cost saving solution for you. Highly accurate measurements combined with the short examination time and easy handling makes working with the RT-7000 professional and quick. The 6.4 inch coloured touch screen is used as operating monitor as well as for displaying all measured values. You can even move the unit in all directions by simply touching the screen. All commands can be done via touch screen. The handling of the RT-7000 is very easy – it does almost everything by itself. Alignment and measurement are done automatically. You just roughly align the system towards the patient eye and the rest is taken care of by the instrument. Tear stability analysis system for analysing the tear film stability by using the light cone system in the RT-7000. That offers you several measurement and analysing functions to detect patients with dry eye indication. Once you have captured your patients eye you can set the pupil and cornea measurement bars to measure the individual diameter. For immediate understanding of the cornea topographic structure we have implemented the topographic indices KAI (Kerato-Asymetry Index) and KRI (Kerato-Regularity Index). These values are highlighted in colour (green = normal, yellow = suspect, red = abnormal) to provide you a quick information about the corneal structure behaviour.